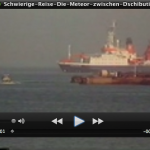 In 1987 the newly built German research vessel »Meteor« set sail towards the Indian Ocean. During the travel section between Djibouti and Oman, Hanns-J. Neubert and Ernst Hammers documented the research work for the German TV. The 45 minutes documentary was broadcasted first in autumn 1987. Before the expedition started, an explosion in the centrally located restaurant »Historil« exploded, killing 3 of the scientists, injuring 4 others seriously. It was a serious shock for German marine research. 20 years later, in 2007, Hanns-J. Neubert contributed to the booklet »Rememberances of Djibouti 1987«.